Pacific Wax Myrtle is native along the direct coast from Santa Barbara California to near Tofino, on Vancouver Island, BC. It forms a large shrub to small tree in time and has thin, pretty dark green foliage. Aromatic if bruised the tiny brown flowers change to waxy gray berries that line the stems. Fast growing to 12′ tall and 8′ wide in 7 years. Judicious pruning can keep it much smaller. 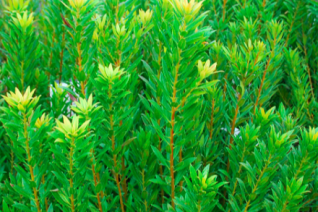 An excellent, drought tolerant, cold tolerant shrub for a hedge, screen or small garden tree. Our material is from locally cold hardy stock. Easy. Oregon native plant.